Our board of Deacons at Oxford Presbyterian Church is composed of twelve members elected by the congregation. Throughout the year, the Deacons strive to bring the congregation closer as a church family through actions such as social activities, lending a hand, comforting and aiding others, and through prayer and fellowship. Our Fellowship committee strives to provide activities that are all-inclusive to church members in a welcoming and social environment, encouraging people to get to know one another and grow as a family of Christ. We always welcome new members and/or suggestions for fellowship events. Be sure to look for our upcoming events in the calendar as we hope to see you there! Pastoral Care is a subcommittee of the Board of Deacons. We meet monthly on the first Sunday after the 8:15 service. Our goal is to support, encourage, shepherd, and care for all of the members of the church. We continue to help support the Elders and Deacons as they shepherd or “keep in touch” with members of the church. ➢ Meals for those that are sick, just had a baby, or are homebound. ➢ Visits to those who are homebound or in the hospital. ➢ Care packages to our college students and those serving in the military. ➢ Providing Dove sun catchers to those that lost a spouse. ➢ Fruit baskets or flowers to elderly members at Thanksgiving. ➢ Providing CD copies of the church service to homebound individuals. The Wellness Council’s mission is to provide a Christ-centered, holistic ministry promoting healing and wellness of Body, Mind, Soul and Spirit, while proclaiming the unconditional love of Jesus Christ. We want to see the church as a community where there is a supportive environment from the beginning of life until it ends. Also under the responsibility of the Deacons, the Wellness Council plans and provides information, programs, and services that promote healthy living choices, wellness, prevention, and spiritual well-being. All women of Oxford Presbyterian Church are members of Oxford Presbyterian Women (OPW) and are encouraged to participate in planned OPW events and study groups. The Prayer Chain keeps members informed of illness, deaths and other prayer needs. Please call the church office to request prayers. 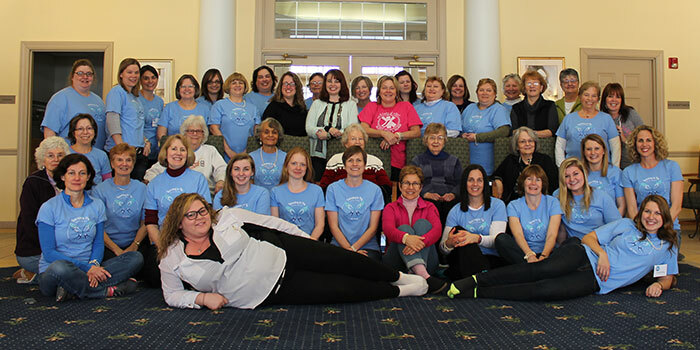 Every year, the Presbyterian Women sponsor an annual retreat for the women of Oxford Presbyterian Church. During the weekend event, we hold two fundraisers: a silent auction and a sock auction which always provides plenty of excitement and entertainment. Monies raised from these auctions go to support attendance at future retreats as well as various missions. We are very proud of the overwhelming generosity of our women retreaters and are always amazed at the passion the women of OPC have for socks! The Presbyterian Women, with the help of many volunteers, also support the nourishment of the congregation through the Kitchen/Hospitality Coordinators. Throughout the year, this group prepares meals for weddings, funeral receptions, Lenten Lunches, and the annual Lighthouse Youth Center Auction. These functions are the main source of income, which in turn supports our Mission projects. The Building and Grounds Committee has the oversight of church property and is responsible for its maintenance, building use, improvements, cleanliness, lawn care, expansion and security. The committee encourages members of the congregation to take part in any of these areas in order to become an active part of the life of our church. Be on the lookout for both the Fall and Spring Cleanup days. The committee is chaired by Rob Shaffer and open to anyone who wishes to attend. The Administration and Personnel Committee’s role is to oversee the employment of the paid church staff. We seek to ensure that appropriate policies and procedures are followed with regard to equal employment opportunity, fair employment practices, and that reasonable compensation for services is provided to all employees and candidates for employment. We discuss and make recommendations to Session about staff position descriptions, compensation and personnel policies. The committee provides support to staff with regard to professional, personal, and family crises and conducts staff evaluations. For information on becoming a part of the Administration and Personnel committee please see Geoff Henry. The Finance Committee is charged with watching over and guiding the finances and day-to-day activities of the church. Tasks include preparing the annual budget, managing the Church’s Special Funds, and overseeing Stewardship, Memorials, Endowments and Gifts, and Insurance. The goal of Finance is to work towards finding ways to reduce costs and waste, discovering ways to better use our financial resources and improving our day-to-day habits of running a church. The Finance Committee meets the first Thursday of the month at 6:30 PM in the Library/Conference room and is chaired by David Fomunyam. Our sanctuary sound booth for recording and sound is operated by a team of dedicated members who faithfully man the booth during all worship services, special events, weddings and funerals. They are responsible for the CD recordings for members who cannot make it to church. The IT committee explores ways in which Oxford Presbyterian Church can better reach and meet the needs of our congregation and community using today’s technology. They work to maintain the church’s website and Facebook as well as our internal, operating needs including the church wireless network, computer equipment, and software. The Stewardship Committee is responsible for sharing with the congregation the needs of the church to fulfill its mission. We encourage our membership to commit their time, talents and treasure to accomplish that goal. A campaign is organized for implementation during the fall of the year. Our Committee, led by Geoff Henry, meets when it is necessary to discuss and finalize our campaign approach. How can our members find their “niche” in our ministries? Member development seeks to connect OPC members and their talents with opportunities for involvement within the church. As we oversee the membership of the church, both new and old, we track attendance, send cards in recognition of life events, and follow up on how OPC is or could better meet the needs of our members. We also look to match our new church members up to Sponsors who can help with any questions, concerns, and generally make the new members feel welcome. If you are interested in being a Sponsor, let us know. The Membership Development Committee is chaired by Ashley Whiteman and meets the first Tuesday of each month at 7:00 PM in the Library/Conference room. Members of our congregation are called to serve as Elders and Deacons each year. What are your gifts? How will you answer when God Calls? The Nominating Committee traditionally meets in the fall to identify and present candidates for election to The Board of Deacons and The Session. Each Session and Deacon class serves a three-year term; youth members serve a one-year term. If you are interested in either, please see a member of the Nominating Committee, led by Ed Jefferis. IMPORTANT Pastor Nominating Committee Update!! Congregational Meeting called. Click for details! Community Meal April 28, 5:30-7:00 PM in Fellowship Hall. Free Meal, Everyone Welcome!! Our mission is to be a “family of Christians dedicated to proclaiming the unconditional love of Jesus Christ to the local and world community.” Wherever you are in your journey of faith, we have a place for you here! Oxford Presbyterian Church Copyright © 2019. Site designed by inkspotts creative.